Perfect for start ups and low volume shops. 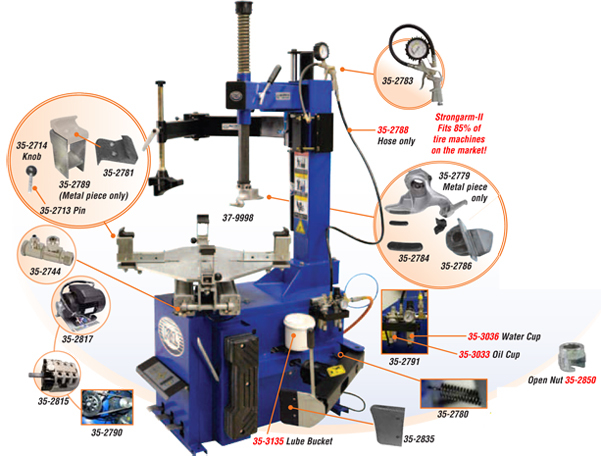 This machine is specially designed for motorcycle tire-changing, and is an affordable solution to shops requiring a powered tire machine. New from K&L Supply, the Strongarm II gives you the edge you need when changing new generation tires. Touring and Police bikes have extremely stiff sidewalls; making tire manipulation difficult even after the bead is broken. The Strongarm II uses air pressure to assist holding the tire’s bead in the drop center of the wheel, even while the turntable is revolving. The Strongarm II mounting system is designed to work with most popular tire machines, and helps to keep tire changes a one-person job.